The key message of The Laws of Disruption is that IT and other executives need to know a great deal about law—and more all the time. And Techdirt does an admirable job of reporting the latest breakdowns between innovation and regulation on a daily basis. So I was happy to participate. Not surprisingly, there were far too many topics to cover in a single seminar, so we decided to focus narrowly on just one: potential legal liability when data security is breached, whether through negligence (lost laptop) or the criminal act of a third party (hacking attacks). 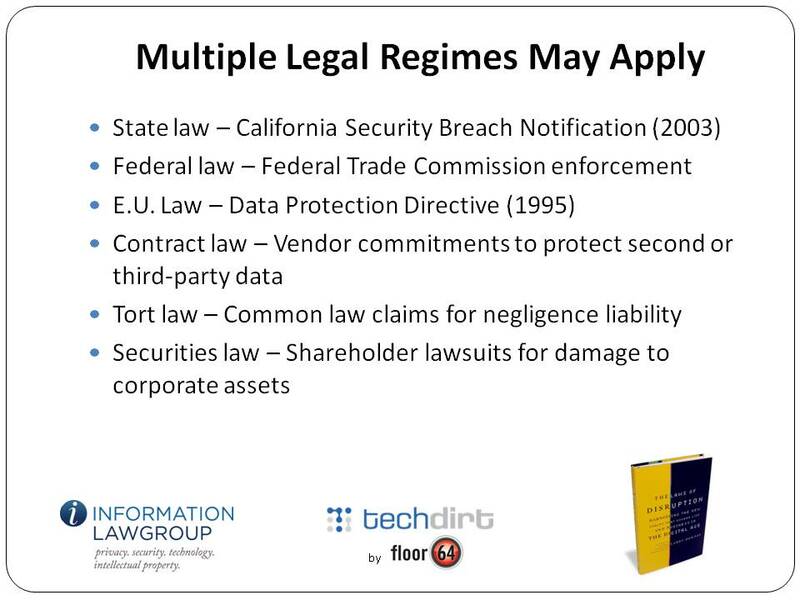 We were fortunate to have as the main presenter David Navetta, founding partner with The Information Law Group, who had recently written an excellent article on what he calls “legally-defensible security” practices. The move to cloud computing amplifies and accelerates the potential nightmares. In the cloud model, data and processing are subcontracted over the network to a potentially-wide array of providers who offer economies of scale, application or functional expertise, scalable hardware or proprietary software. Data is everywhere, and its disclosure can occur in an exploding number of inadvertent ways. If a security breach occurs in the course of any given transaction, just untangling which parties handled the data—let alone who let it slip out—could be a logistical (and litigation) nightmare. Which is not to say that the bungling of data that affects millions of users necessarily translates to legal consequences for the company who held the information. Often, under current law, even the most irresponsible behavior by a data handler does not necessarily translate to liability. That, at least, is the common law regime that applies in the U.S. The E.U., under laws enacted in support of its 1995 Privacy Directive, follow a different rule, one that comes closer to product liability law, where any failure leads to per se liability for the manufacturer, or indeed for any company in the chain of sales to a consumer. A case last week from the Ninth Circuit Court of Appeals, however, reminds us that a finding of liability doesn’t necessarily lead to an award of damages. In Ruiz v. Gap, a job applicant whose personal information was lost when two laptop computers were stolen from a Gap vendor who was processing applications sued Gap, claiming to represent a class of applicants who were victims of the loss. All of Ruiz's claims, however, were rejected. Affirming the lower court and agreeing with most other courts to consider the issue, the Ninth Circuit held that Ruiz could not sue Gap without a showing of “appreciable and actual damage.” The cost of forward-looking credit monitoring didn’t count (Gap offered to pay Ruiz for that in any case), nor did speculative claims of future losses. Actual losses, expressible and provable in monetary terms, were required. It’s not just the lawyers who are confused here. U.S. consumers, riled up by stories in mainstream media, seem to live under the misapprehensions that they have some legal right to privacy, or that the protection of personal information that can be enforced in courts against corporations. That is true in the E.U., but not in the U.S. The Constitutional “right to privacy” detailed in U.S. Supreme Court decisions of the last fifty years only applies to protections against government behavior. There is no Constitutional right to privacy that can be enforced against employers, business partners, corporations, parents, or anyone else. The lack of a legal remedy for misuse of private information doesn’t mean that companies can do whatever they like with data they collect, or need take no precautions to ensure that information isn’t lost or stolen. As more and more personal and even intimate data migrates to the cloud, it has become crystal-clear that consumers are increasingly sensitive (perhaps, economically-speaking, over-sensitive) about what happens to it. Consumers express their unhappiness in a variety of media, including social networking sites, blogs, emails, and tweets. They can and do put economic pressure on companies whose behavior they find unacceptable: boycotts, switching to other providers, and through activism that damages the brand of the miscreant. Even if the law offers no remedy, in other words, the court of public opinion has proven quite effective. Even without a court ordering them to do so, some of the largest data handlers have made drastic changes to their policies, software, and how they communicate with users. Looming in the background of these stories is always the possibility that if companies fail to appease their customers, the customers will lobby their elected representatives to provide the kind of legal protections that so far haven’t proven necessary. But given the mismatch between the pace of innovation and the pace of legal change, legislation should always be the last, not the first, resort. And that means, as we conclude in the seminar, that IT executives making security decisions had better start talking to their counterparts in the general counsel’s office. Because as hard as it is for those two groups to talk to each other, it’s much harder to have a conversation after a breach than before. IT makes decisions that affect the legal position of the company; lawyers make decisions that affect the technical architecture of products and services. The question isn’t whether to formulate a legally-defensible security policy, in other words, but when. Previous article:FCC Broadband Reclassification: Third Way or the Highway? What’s Holding Consumers Back from the Internet of Things?